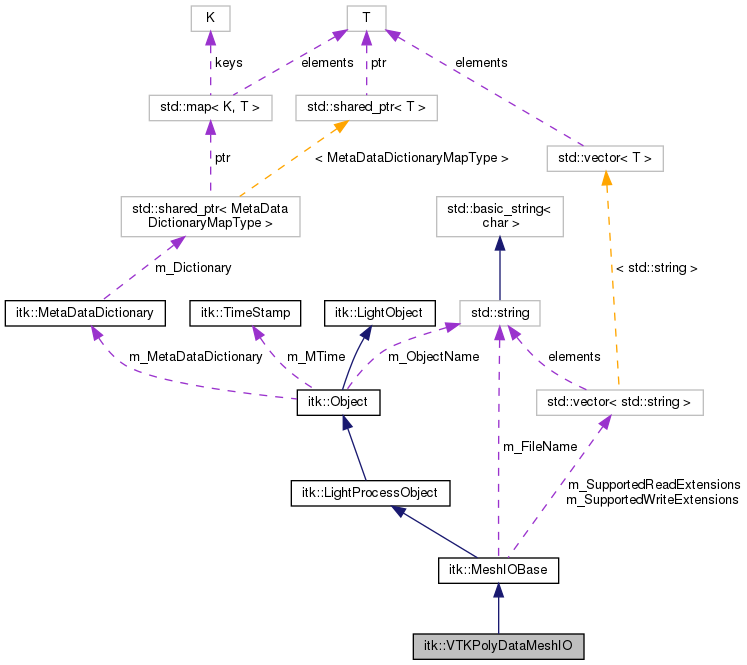 This class defines how to read and write vtk legacy file format. Wanlin Zhu. Uviversity of New South Wales, Australia. Definition at line 40 of file itkVTKPolyDataMeshIO.h. Definition at line 49 of file itkVTKPolyDataMeshIO.h. Definition at line 48 of file itkVTKPolyDataMeshIO.h. Definition at line 56 of file itkVTKPolyDataMeshIO.h. Definition at line 58 of file itkVTKPolyDataMeshIO.h. Definition at line 57 of file itkVTKPolyDataMeshIO.h. Definition at line 46 of file itkVTKPolyDataMeshIO.h. 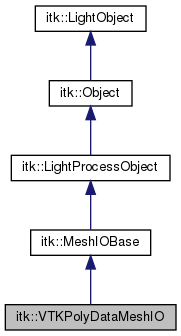 Definition at line 51 of file itkVTKPolyDataMeshIO.h. Definition at line 55 of file itkVTKPolyDataMeshIO.h. Definition at line 53 of file itkVTKPolyDataMeshIO.h. Definition at line 54 of file itkVTKPolyDataMeshIO.h. Definition at line 47 of file itkVTKPolyDataMeshIO.h. --—— This part of the interfaces deals with reading data. –— Determine if the file can be read with this MeshIO implementation. Convenience method returns the IOComponentType corresponding to a string. Definition at line 319 of file itkVTKPolyDataMeshIO.h. Definition at line 366 of file itkVTKPolyDataMeshIO.h. Definition at line 1142 of file itkVTKPolyDataMeshIO.h. Definition at line 223 of file itkVTKPolyDataMeshIO.h. Definition at line 270 of file itkVTKPolyDataMeshIO.h. Definition at line 175 of file itkVTKPolyDataMeshIO.h. Definition at line 196 of file itkVTKPolyDataMeshIO.h. Definition at line 120 of file itkVTKPolyDataMeshIO.h. Definition at line 904 of file itkVTKPolyDataMeshIO.h. Definition at line 1035 of file itkVTKPolyDataMeshIO.h. Definition at line 447 of file itkVTKPolyDataMeshIO.h. Definition at line 588 of file itkVTKPolyDataMeshIO.h. Definition at line 1097 of file itkVTKPolyDataMeshIO.h. Definition at line 1119 of file itkVTKPolyDataMeshIO.h. Definition at line 707 of file itkVTKPolyDataMeshIO.h. Definition at line 842 of file itkVTKPolyDataMeshIO.h. Definition at line 414 of file itkVTKPolyDataMeshIO.h. Definition at line 435 of file itkVTKPolyDataMeshIO.h.